The Mother of all Irish Yews in the world was found by a farmer, George Willis in 1740 in the Cuilcagh mountains in County Fermanagh, Northern Ireland. It was planted by his land lord, Lord Enniskillen at Florencecourt house. The Irish Yew is a dark and sombre tree with an ability for perpetual renewal and in this tradition the Mother of all Irish Yews can still be seen at Florence court. This smooth gold coloured wood was use to make dagger handles. 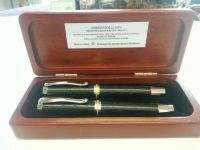 bows, wine barrels and now elegant pens!